Is Windows Phone 7 Right For Business? Amid all the hoopla surrounding the introduction of Windows Phone 7 Series this week in Barcelona, Microsoft's core customers have been almost totally left out. It's hard to imagine that business customers aren't important to Microsoft anymore, but at the announcement of the new smartphone OS in Barcelona, business certainly got short shrift. Read our overview of Windows Phone 7 Series. Here's one way to gauge the importance Microsoft places on the business features of the new operating system: Out of a 70 minute keynote presentation, less than two-and-a-half minutes were spent demonstrating business-specific features, and none in detail. Despite a large installed base of business users--second only to Research In Motion's BlackBerry installed base--Microsoft has taken a decidedly consumer approach to its new phones. The user interface, intended to generate ooh's and ahh's, is perhaps a tad precious or at least very busy. It demonstrates beautifully, but how will it work when fully loaded with a busy user's contacts and other information? How will it deal with a glut of Facebook friends and business social network updates? Will the animations help or get in the way? Compared to Apple's iPhone, the Windows Phone 7 interface, with its animation and panoramas, might be considered over the top. On the other hand, it makes Android look more like a Windows PC than a modern smartphone. Can such a dazzling user interface be effective for busy business users? Or will all the consumer features get in the way? How will third-party business applications look and behave? Time will tell. HTC says it will ship its first Windows Phone 7 device in the fourth quarter. So where does business become part of Windows Phone 7? The flashy (lower-case, since Flash is not part of the device) new UI is fronted by a start page and five "hubs" that serve as centers for user activities on the smartphone. The hubs are: People, Pictures, Games, Music + Video--and, yes, Office. 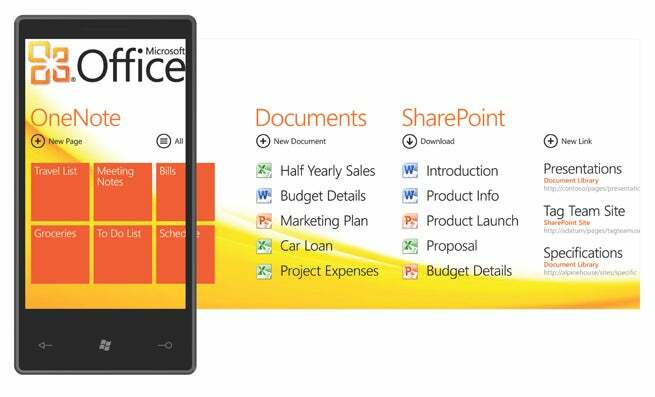 Windows Mobile 7 provides Outlook functionality--e-mail, contacts, and calendar--both as part of its basic smartphone features as well as from the Office Hub, which provides a single home for access to Office applications, SharePoint, and OneNote. We do not know what those applications will look like under Windows Phone 7 Series. They were not shown during the demo, making me wonder whether they are actually finished. "I'm a huge fan of OneNote. I love taking notes in OneNote. And that's a scenario that's great on a phone," said Microsoft VP Joe Belfiore, during his keynote demonstration. Indeed, OneNote is a key component of the Office Hub, perhaps more key than any current user of a Windows Mobile device would have chosen to make it. "SharePoint is a terrific experience, whether you're a company that has SharePoint Servers inside your firewall, or a small business or individual and you want to store documents in SharePoint as part of Windows Live. So, what we've tried to do is take that experience from the applications, and documents, through note taking to the service, and bring it together on the phone," Belfiore said. The Office Hub, along with integrated Outlook functionality, is intended to gather the business features and functions into a single place. The Office Hub UI (see illustration with his story) right-to-left to reveal three work areas: Notes, documents, and SharePoint. The demonstration and screenshot looks very simplistic. Again, I am concerned about what happens when a user has a large number of notes, documents, and shared projects. How fast and facile will the user interface seem then? We also haven't been told about enterprise services and connectivity for the phone, although Belfiore said the document editing experience is "consistent" with the forthcoming Office 2010. It is far too early to make any real judgments on Windows Mobile 7. I want to think it will be as exciting for business users as for consumers, but that is almost impossible. Business apps just aren't as much fun as music, video, and games. At least not where I work. What we can hope for, however, is that the consumer glitz won't actually impair business use of Windows Phone 7. Regardless, one thing is certain: All of today's other smartphone user interfaces look pretty staid by comparison.